Should You Spend More Time or Money on Father’s Day? Most dads are special people who show unconditional love, provide support, offer a shoulder to cry on when things get rough, teach manners to their children, and come through when you need them. They deserve a little extra attention on their special day. Not all dads expect presents or anything else you have to spend money on. Even if you choose to purchase a present and gift wrap it for your father, get creative and create memories that will last longer than a “#1 Dad” mug, necktie, or personalized golf towel. There are quite a few different ways to celebrate Father’s Day. For example, a small child’s drawing of the family can touch the heart of a dad as much as a gift card from an adult son or daughter. A new dad will appreciate special acknowledgment from the baby’s mother. Whether the patriarch in your life is your biological father, your stepdad, or a male figure who has guided you toward and through adulthood, you’ll want to honor him on this special day. He’ll appreciate the acknowledgment, even though that’s not the reason he has taken on this leadership role. There is no one-size-fits-all for Father’s Day, so put some extra thought into what you think he would like. If you’re part of a blended family, you can still celebrate all the dads involved. It’s important to carve out at least a few minutes to show your appreciation for each fatherly person in your life. Avoid bringing up any hard feelings you’ve had in the past. If you write a message to your dad or stepfather, express only the positive thoughts. After all, this is a day of celebration, not venting. If you’re the mother of children who have both a living father and stepfather, put aside any negative emotions and thoughts and encourage them to express their love to both men. 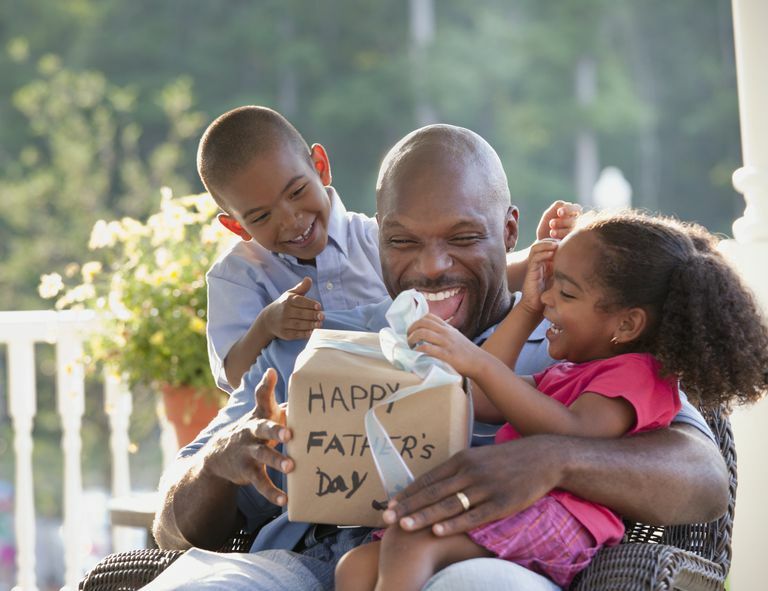 Your children may want to spend the entire day with their biological father, so set aside another day or time for them to celebrate with their stepdad if he’s actively involved in their lives. Children who have a living dad and stepdad should never feel guilty about spending time with both, so let each relationship stand on its own without the baggage of the parents’ divorce. Never feel that gifts for both men have to be equal. As long as they are well thought out, the dads should be happy for the thoughtfulness. Most dads appreciate time and thoughtfulness more than an elaborate gift. If you have plenty of money and want to buy a nice gift, go ahead and purchase what you can afford. But don’t just throw it at him and go on about your merry way. Plan something special and make the gift a part of the celebration and not the only thing you do. If you’re like many people, you don’t live in the same town as your dad. If you’re not able to physically be in the same location, call him and let him know how much he means to you. Keep the call positive and uplifting by thanking him for some specifics. He always works (or worked) hard to keep a roof over your head, clothes on your back, and food on the table. He treats the family with respect. He was always there for you when you needed someone to listen. He attended most of your games or recitals. He let you watch cartoons on TV, even when his favorite sports team was playing. He has always found ways to spend time with you. He made sure every moment spent with you was special. It’s also good to send a card in advance. Calculate the time it takes to get there and pad it with an extra day or two to make sure he gets it before your phone call. If you have the financial means, it’s nice to add a gift or gift card for something that would interest him. Whether you’re celebrating Father’s Day as an adult or you want to show your husband some extra love during the first year of your baby’s life, you’ll want to make it a day he can look back on with fondness. Let him sleep in, and when he awakes, bring him his breakfast on a nicely decorated tray. Cook him a meal with all his favorite dishes, and don’t forget dessert. Take him to his favorite event, such as a ballgame or concert. If you have the financial means, give him something he wouldn’t typically buy for himself. This can be an electronic device, drone, remote control toy, or anything else you see on the “As Seen on TV” aisle in your local big-box store. Write him a story or poem touting all his positive traits and reasons he’s special to you. This can be as serious or comical as you want it to be. Take him on a drive with a surprise destination. This can be a picnic at the park, a weekend getaway, a local tourist attraction, or anyplace you think he would enjoy. Treat him to a meal at his favorite restaurant. Do some of the chores he typically does for the family, such as mow the lawn or wash the car. Fill a basket with his favorite treats and other items that will remind him of how much you love him. Some things you might want to include are coffees, teas, bottles of wine, a personalized coffee mug, magazines, books, tickets to a game or movie, golf balls, tennis towel, a personal coupon book for massages, favorite meals, and chores around the house. Give him a one-year subscription for a dozen of his favorite cookies, cake, or pie every month. Fathers of brand new babies often get overlooked since the focus has been on the mom for nine months and now the precious little bundle of joy. Don’t forget how important of a role he plays in the life of the baby. Remember that grandfathers were fathers first. Whether your grandpa was physically there with you as you grew up or he rooted you on from a distance, he’ll appreciate some sort of acknowledgment on this special day. At this point in his life, he probably doesn’t expect a tangible gift. A personal message in a card, a letter, or framed photo will brighten his day. One of the things that most fathers will appreciate in addition to anything else you do is a thank you note just for being your dad. On a piece of scratch paper, jot down a list of your father’s attributes and add them to the message. And don’t forget to tell him how much you love him. That will probably mean more to your dad than anything else.